The Cambrian explosion of species occurred around 525 million years ago, when the atmosphere suddenly became enriched in oxygen and the number of multicellular living species also increased considerably . This diagram gives a good idea of the sharp acceleration in evolution during the Cambrian period, with the appearance of many kinds of living species. The name reflects not only the explosion of the first multicellular organisms but also of the wide diversity of living species, some of which have no present day equivalent. The fossils of the famous Burgess formation, in Canada, carry evidence of this, especially with Hallucigenia. 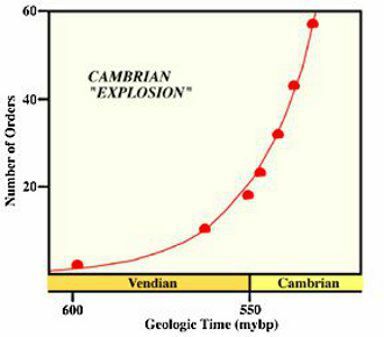 The Cambrian explosion is aptly named if we look at this graph showing the rise in the number of orders of living species that appeared at that time.